Video could be paused from time to time during viewing for further explanation and questions; it is too dense to show all at once. This video documents how human activities are affecting global temperatures. A good treatment of greenhouse gases, climate forcing agents, and feedback loops in climate change. The unit "watt" is used incorrectly in this video. A watt is a unit of power, not energy. Energy is measured in Joules, and can be expressed as a watt multiplied by a unit of time (ex. a kilowatt-hour is a unit of energy, a kilowatt is a unit of power). Comments from expert scientist: Good overview of the science with no major errors. A lot of information is packed into the video - teacher will need to unpack terms and concepts that are presented rather quickly. 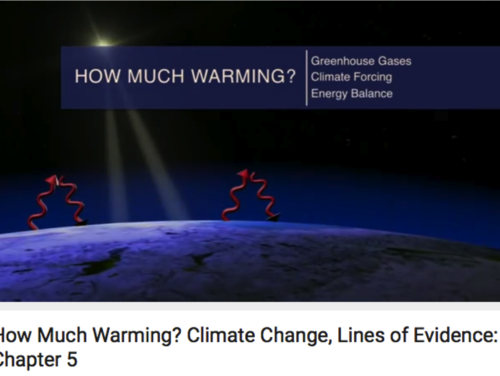 The other six videos in this series, plus a booklet, and copies of all the graphics and figures used in the booklet are available here: [link http://nas-sites.org/americasclimatechoices/videos-multimedia/climate-ch... 'Climate Change: Lines of Evidence']. The booklet is also available in Spanish. The National Academy of Science is a highly respected body of scientists, and this is an important point to raise with students. Good graphics and clear examples are used. Closed-captioned text is available, but there are errors in the text. The video is of sufficient quality to be viewed in full-screen mode for projection.